The panel can be stretched and placed in the desired order, but here it's not recommended. This panel is for displaying additional buttons automatically. This panel appears on right mouse click, or double click on empty space, or Ctrl+Click, or Left+Right+Click. 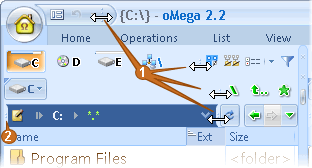 This panel allows inserting/deleting separators, copy the panel into clipboard and others. Selected button can be dragged. To select press Ctrl+Click, or Left+Right+Click.